Albany City Hall is located at 333 Broadalbin Street Southwest, Albany, OR 97321; phone: 541-917-7500. Photo: John Ralston House, ca. 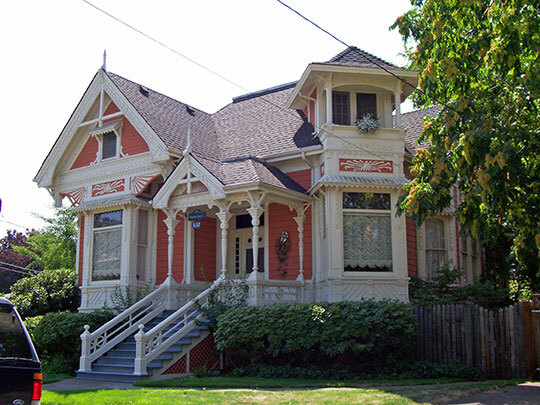 1889, 632 SE Baker Street, Albany, OR. Listed on the National Register of Historic Places in 1981. Photographed by User:46percent (own work), 2009, [cc0-by-1.0 (creativecommons.org/publicdomain/zero/1.0/deed.en], via Wikimedia Commons, accessed October, 2014. In the mid-19th century, Walter and Thomas Monteith settled in the Willamette Valley, and named their new claim after their hometown in Albany, New York. Just a few years later, Abner Hackleman secured a claim just to the east of the Monteiths. Albany's early development occurred within the two land claims of the Monteiths and the Hacklemans. Agriculture was the first major industry in Albany, with wheat as the principal crop for Linn County from 1845 to 1885. The founding of city's agricultural industry fortuitously coincided with a period of expansion along the West Coast, resulting in rapid development. Residents of Albany took advantage of these trends by founding cooperative organizations that supported farmers locally and statewide. For example, Cyrus Hamlin Walker, a property owner in the proposed expansion area, organized forty-three granges throughout Oregon. Granges worked to improve river transportation and to facilitate the transport of agricultural products without costly rates for shipping. This cooperative attitude among farmers continued, and by 1915 Linn Benton Cooperative Growers Association incorporated. As the importance of agriculture grew, so did processing facilities. Canneries, and mills began operating in the early-twentieth century. By the mid-twentieth century the agricultural economy began to diversify. Grass seed replaced wheat as a major agricultural product. Dairy and poultry farming also grew, as did the export of milk and poultry products. Timber-related industries also began to appear in the 1860s, such as sawmills and sash, door, and furniture factories. As Albany grew so did the need for reliable sources of water and power and good transportation routes. To meet these demands, Thomas Monteith, owner of the successful Magnolia Flour Mill, conceived of a canal system as a means of enabling freight to be transported by barge over man-made waterways. The canals were completed by Chinese laborers in 1873. Due to the swiftness of the water, Monteith's idea didn't emerge as he originally conceived, but the canal system provided hydropower to the waterfront industries like the Magnolia Flour Mill. By 1880, fourteen turbines supplied power to sawmills, flourmills, a foundry, and a twine mill. The Santiam Canal began at the Santiam River below Lebanon and from there ran about twelve miles to Albany north along Vine Street. Along its route, the canal provided much needed irrigation water and was often used to water stock. The canal divided at 8th Avenue and Vine Street with the main branch extending north along Vine and emptying into the Calapooia River. The second branch extended eastward down 8th Avenue to a canal in Thurston Street, and then northward to the Willamette River. This branch of the canal provided power to run the Red Crown Mill. In addition to water power, the canal supplied drinking water to Albany and in 1888 it provided power for Albany's first electric lights. Electricity, lights and phone service were provided by power generated from the canal. Eventually Mountain States Power Company operated the Albany Canal from 1918 to 1954 when it was sold to Pacific Power and Light. Growth and development within the Monteith District, as well as the expansion area tended to occur earlier along the canals, most likely due to the development of roads like Vine and 8th and other infrastructure built to support the construction and maintenance of the canals. Albany's successful industries drew many people to the town in the late-nineteenth century. Growth in agriculture and related industries between 1845 and 1865 caused Albany's population to increase to 800 people. Reflecting the town's rising importance, Albany's first college (Albany Collegiate Institute) was established in 1867, just east of where Central School is today on the southwest corner of 9th Avenue and Broadalbin Street. A growing population required more housing. By 1878, four additions were added to the original town plat: Eastern Addition, Hackleman's Addition, Hakleman's Second Addition, and Monteith's Southern Addition. By 1880, the population had grown to 1,800. The City's most significant period of growth occurred during the next ten years as the population almost doubled to 3,079. As the population grew, a significant number of residences were constructed in a wide variety of styles to accommodate the population's varied architectural tastes. Since many of these dwellings remain intact within the original sections of the City, Albany has been recognized as having one of the best collections of historic middle-class/working-class residential architecture in the State. Kimberli Fitzgeralds and Tama Tochihara, Historic Preservation Consultants, Albany Landmarks Advisory Commission, Albany Monteith Historic District Boundary Expansion, nomination document, 2008, National Park Service, National Register of Historic Places, Washington, D.C.